An old friend of mine, when teaching a course in introductory economics, used to give students a list of 10 economic statistics that he wanted them to know on the final: basic stuff like the unemployment rate, the poverty rate, total federal spending, the level of Dow Jones Industrial Average, and the like. The first 10 questions of the final just asked students to recite these statistics. He used to rant and laugh a bit about the results: "It's 10 easy points! I tell them the ten statistics in advance! And many of them have no clue!" The Pew Research Center does regular national surveys of what Americans know about the news. 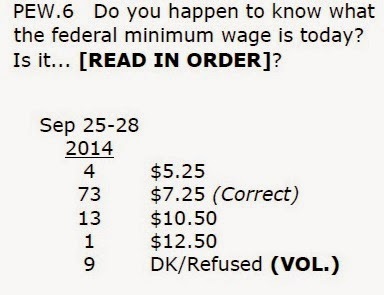 Here are the questions and answers about economics from the September 25-28 survey. Many Americans dramatically overstate the unemployment rate and the poverty rate. 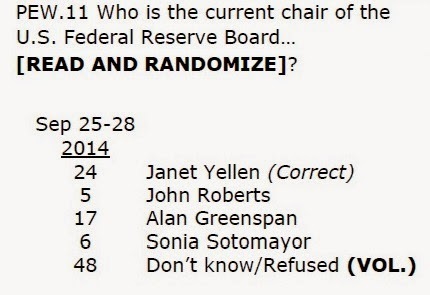 Nearly half of those surveyed don't even venture a guess about who runs the Federal Reserve. Indeed, of those who answered, a certain number seem to have some confusion about the difference between the Supreme Court and the Federal Reserve. 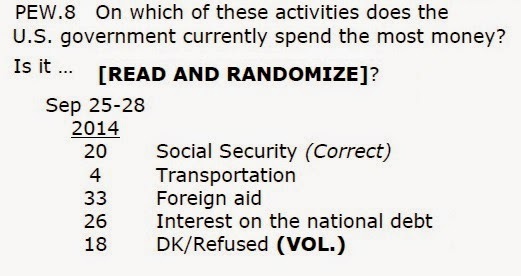 In many surveys over the years, Americans state that a huge share of U.S. federal spending goes to foreign aid: a common finding is that Americans think about 25% of US spending goes to foreign aid, when the correct answer is about 1%. And while interest payments on past federal borrowing are up in recent years, they are far short of Social Security payments. One statistic where Americans do seem fairly accurate is the minimum wage.